When President Obama sat down to sign the health care bill into law, he warned: "This is gonna take a little while" — because the president used 22 pens to affix his signature to that one document, jotting down one tiny portion of a letter at a time. The president then began handing those pens out as souvenirs — many of them to legislators who helped steer the bill through, honoring the tradition of giving away presidential signing pens. At least since President Truman, presidents have been using pens and handing them to people who helped push bills through. Probably the most famous one is when LBJ signed the Civil Rights Act. He used multiple pens when it was signed. Harry Truman was the first one to have a box of pens. This tradition was actually started by somebody who sent President Truman a box of pens that said, “I swiped this from Harry Truman's desk.” The Parker Jotter pen was President Kennedy's favorite pen to use at bill signings. Legend has it that he handed off the pens used to whoever was in attendance, as a souvenir of the occasion. Presidents Gerald Ford and Jimmy Carter used Parker pens, somewhat more expensive models than had been used up to that point. That continued through President Ronald Reagan, although a variety of models were used. During President Bill Clinton‘s administration, Cross pens came to be used. 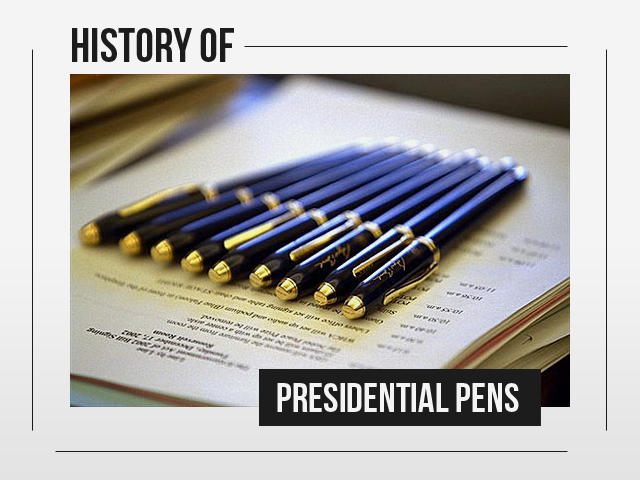 But it was during the administration of President George W. Bush that the presidential pen took on new heights, with the adoption of the Cross Townsend Selectip, a heavier, more expensive pen that can be loaded with a ballpoint tip, a roller ball or a felt marker.